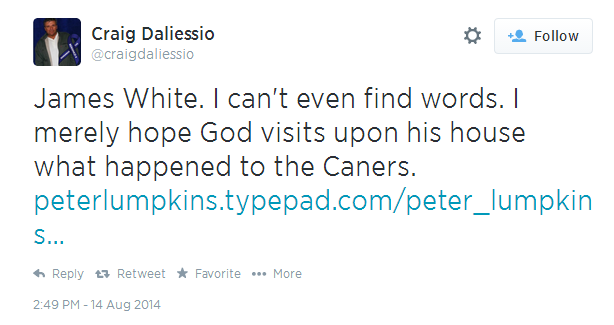 Perhaps what is even sadder than Peter's posts and re-tweets of others who are all but blaming James White and J.D. Hall for the death of Braxton Caner - is the silence from anyone else in a leadership position in the SBC, allowing Peter to continue playing this blame game. I read what Peter is writing and what he is favoriting and re-Tweeting on Twitter, and I can scarcely believe those in power in the SBC haven't given Peter the hook, or at lease told him to cool his rhetoric and blame. Peter is a leader in the Southern Baptist Convention. He is a vice president of one of the Baptist colleges in Georgia. He is on the payroll of the GBC. He is the Caner family "spokesman", according to Baptist Press. Make no mistake, Peter Lumpkins IS the voice of the SBC right now in the wake of this tragedy. And you have to ask: why is the SBC not reigning him in? Johnny Hunt, Bucky Kennedy - someone in the GBC - if you can get Matthew Lehew - an employee at Shorter University - to take down his blog post critical of Brewton Parker within 24 hours of it posting, surely you can get Peter Lumpkins - Vice President of Brewton Parker - to calm down, stop the blame, and concentrate on doing his job and addressing the accreditation problems at his school instead of being on a vendetta to punish and accuse his boss's critics. Despite Ergun Caner himself this past Sunday telling the congregation of Northside Baptist Church in Tifton, GA that he doesn't know why his son took his life, that a note wasn't left, that he wished he knew why his son was in so much pain - Peter STILL - every single day but one since Braxton's funeral - Peter has been on the attack to pin the blame of Braxton's suicide on J.D. Hall, James White and the "cyber bullies" that are located "in several states including Arizona, Florida, California, Virginia, Georgia, and even foreign countries like Canada." Yes, "1 stalker down, 1 to go - JW" - and a warning shot to James White on August 9th, that Lumpkins is now setting his sights to bring him down. 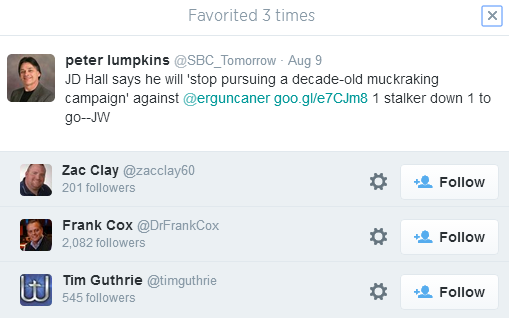 And for good measure, former SBC President Frank Cox favorited Peter's Tweet. And just how will James White be taken down? That's easy. Just go on social media and declare that he was - or ask "was he?" - the cause for Braxton Caner's suicide. For example, fundamentalist, KJV-only IFB blogger named Dr. James Ach, has written several posts laying blame for Braxton's suicide at the feet of JD Hall. On August 8th, Ach declares White is not implicated in Braxton's death - but after Peter declares a day later it is time to take down James White on August 9th, well, Dr. Ach knows just what to do. Wait, I thought Dr. Ach said on August 8th so "graciously" that Jame White was NOT implicated. Now he revisits the topic, and just maybe, that James White character DID cause Braxton's death. I guess Ach wasn't listening to God closely enough on August 8th. You just have to shake your head at these pious, pompous "men of God" and how they think they know the deep secrets no one else knows. But why am I drawing attention to these articles by James Ach? After all he's just a KJV-only, IFB'er, not affiliated with the SBC. I'm only bringing Dr. Ach into this because Peter Lumpkins is pushing this guy's theories that we need to at some level be blaming Braxton's death on James White and J.D. Hall. Here is Peter Lumpkins "favoriting" Dr. Ach's tweet to the article above! "Yes, thanks Dr. Ach, for getting the message and going after Dr. White!" So there we have it. A leader in the SBC, the vice president of one of the Georgia Baptist Convention's colleges, the "family spokesman" for the Caner's, is on social media pointing people to read an IFB'er blame the death of Braxton Caner on White and Hall. These are wonderful days in the SBC. James White did post a statement on social media about whether he will stop calling Caner in the future to account for his past lies. He didn't attack anyone. He didn't attack the Caner family. Just because Peter says White attacked the family doesn't make it so. White stated his views in the context of his own ministry in debating Muslims. Peter Lumpkins went absolutely ballistic, claiming yesterday that White is "back to slamming the Caner family". Warning: you are going to read the most vile, hate-filled, bullying rhetoric when you read Peter's article. Ironically, Peter is himself engaged in the same activity that he is accusing others of. Hard to believe Peter is a seminarian who is trained on all things Christian. Hard to believe he is a leader and spokesman in the SBC and GBC. What does all of this hate and blame from Peter - the SBC spokesman right now - what does it generate? It generates more hate. It is inciting violence and threats of violence against the people who Peter and others are accusing of being the cause of Braxton's death. J.D. has received veiled and not-so-veiled threats via email and phone. One pastor from Texas left him a voicemail wanting to speak to J.D. 's wife and children. I know who this pastor is and I won't give his name here, but the authorities have it. As J.D. receives these, he turns them over to law enforcement as he should. And dare I mention Craig Daliessio's tweets? Craig is a friend of the Caner's, and a follower of Lumpkins. If you want to see what happens when a man gets riled up with hatred in his heart toward J.D. Hall and James White, just browse Craig's Twitter feed over the past two weeks. He has called Hall a "whining cowardly scumball", has said that Hall's "blood on [his] hands gives a whole new meaning to Red Letter Edition". Craig tweeted "Maybe God would allow me the privilege of making JDs millstone necklace." Craig wants J.D. to die. And after Peter posted his latest against James White, it inspired Craig to re-Tweet Peter's rant, and call for someone in James White's family to commit suicide - and hoping that God is the one to bring it about. And this is from a man who's tagline in Twitter describes himself as "All About Jesus"...yes, Craig is all about Jesus, isn't he? And not just social media: a prominent SBC pastor here in Jacksonville even told his congregation from the pulpit the day after the funeral that the suffering of Braxton's dad (i.e. the criticism) was too much for Braxton to bear, causing the suicide. 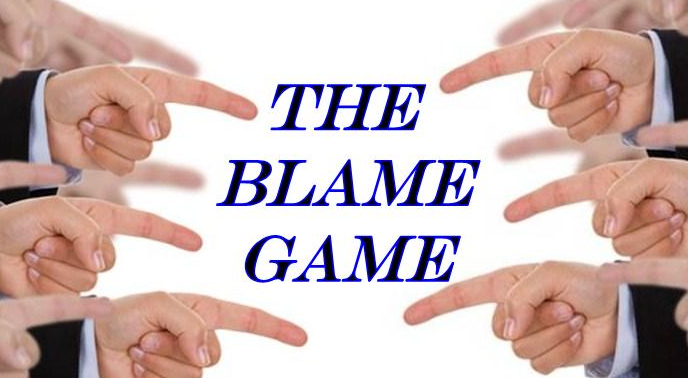 How low can the SBC go in playing the blame game? So this is what we have in the SBC. Peter Lumpkins - baptist college Vice President, SBC pastor and author - inciting hatred and vitriol. Where is Johnny Hunt? Why can't Ronnie Floyd do something to reign in Lumpkins? They need to do something quickly, as he is spinning out of control. Peter has been in a long running battle with James White, and has spent considerable time on his blog in 2010 and 2011 belittling and attacking James White, much of it ad hominem. So it is obvious Peter had an axe to grind with White long before this tragedy, and the SBC heavies need to see that sadly Peter is still grinding the axe, and is now swinging it ferociously at his foes. I don't fault Ergun one bit, even though Peter is the family spokesman. I can’t imagine Ergun would truly want this to be what Peter is spending his time doing. I choose to believe that Ergun is unaware of this and is spending his time in personal grief and helping his family walk through these dark days. I believe Ergun would be be appalled that Peter is using the death of his son to destroy of the reputation of others, blaming them for something that even Ergun says he cannot explain why it happened. I am sure that Ergun would be sad to know that his friend Craig is calling for God to cause the same tragedy in James White's family that he and his family are enduring. To even consider something so sick and sinister - and to call on God to bring it about - much less put it on on social media, is just beyond sick. "Lumpkins has the gall, being the one who is using tragedy as a baseball bat, dishonoring the dead in a despicable fashion, to accuse ME of doing what he well knows he is purposefully doing himself. I asked that everyone give the family time to grieve---who has refused to honor this request? Who created a story out of whole clothe so as to attack Lumpkins' boss' critics? Who has been putting out "cyber-bullying" memes and accusations? Lumpkins well knows what he is doing, and I cannot imagine what it is like for him to try to live with himself. And for what? Money? Prestige? Nothing could be worth the cost of such actions." Pull the plug on Peter, SBC leaders. You did it to Matthew Lehew at Shorter. Do it to Peter Lumpkins at Brewton Parker. He is hurting himself, the Caner's, and the SBC. This is exactly why we do not attend, nor want to attend a SBC church after returning from many years with the IMB in Japan and several years as a tent-maker missionary in Japan. This type of "behavior" is even beginning to show its ugly face in the mid and smaller size churches. We now attend a church that is like what SBC churches used to be like; caring, loving, helping members and non-members. The pastor does not act like a "rock-star." The staff members are dedicated to serving the people of the church and the community. I do not see the future of the SBC as growing and being a positive witness if the type of behavior of those we have been reading about this past few weeks continues to be the "norm." SO SAD! Sorry, sir. You do not understand the SBC. Peter is not a leader in the SBC. He is a VP at a small college in Georgia. The SBC has no authority over the GBC. The SBC has no authority over Brewton Parker. I am not speaking to your view of Peter and his work. But you simply do not understand the way the SBC works.. Thanks Dave, you make my point very well. You come here not to call Lumpkins to cool his heels, but to declare "SBC has no authority over the GBC". That is absolutely laughable. Lumpkins is out of control, and you want to explain the relationship between the GBC and SBC. Lumpkins is low and squalid by even the SBCs dismal standards -- which I lost all respect for years ago. To be on even civil terms with him is to disgrace oneself. Proves there is no Twitter in Heaven! Sorry, Dave, I do understand the SBC and it is not today the organization that sent my family to Japan. Every time we would come home for our SSA there was change. Changes in the way pastors lead the churches, big and small. We have been in many churches large AND small, so are not just repeating something we heard from someone else. There have been drastic changes in attitudes of leadership in IMB, SBC, Fla BC, just to name a few. You get a whole new and different prospective where you are outside the US looking in. I do not claim to be an expert about the SBC, but I have had experiences, I dare say, you have not had. You are so correct about Dave Miller. He was a leader at one time in the SBC and he and the other leaders must have an unwritten rule--they do not speak out against certain others in SBC life regardless of their unchristian actions such as Peter's. They pick and choose who they wish to go after. IMO it is in their DNA. And does one wonder why the SBC is dying? It is despicable what Peter is doing, but no Dave Miller would dare not publish or announce what Peter has or is doing is wrong. "JD Hall says he will 'stop pursuing a decade-old muckraking campaign' against @erguncaner http://goo.gl/e7CJm8 1 stalker down 1 to go--JW"
Notice Peter cleverly makes this look like he is quoting JD Hall, when the "stop pursuing a decade-old muckraking campaign" quotation is not the words of JD, but the words of the biased Baptist Press reporter. You would think the "VP of Communication" of a baptist college wouldn't mislead like that. But that is 'ole Peter! I hope there will be at least one Brewton-Parker trustee who will have enough sense to realize that they are paying Peter Lumpkins to be Ergun Caner's Public Relations Agent.....instead of representing Brewton-Parker College to the community. They are wasting student tuition on Lumpkins. He is more interested in stirring up controversy on his blog and on Twitter than he is actually helping the FAILING college. I am most certain that the vision over 100 years ago for Brewton-Parker College did not include a Religious Mafia and a dysfunctional Board of Trustees who refuse to see what is happening to the institution. If I didn't know any better, I would believe that they actually want to see the school closed. Hiring people like Caner and Lumpkins does not make any sense at all. Why, oh why, after all of the past controversy with BPC over the years; and, especially with the SACS issues, would they EVER consider hiring these two men who are more interested in Twitter than they are a quality education. They seem to forget that BPC is actually an educational institution. As a matter of fact, donors need to realize that financial support of Brewton-Parker College is a complete waste of money at this point in time. The community is terribly deceived by what is going on. It's a crying shame. After reading this, I don't think today's current situation is what the original founders had in mind. Who was this Jacksonvillian SBC pastor? Is it Dr. He-Who-Must-Not-Be-Named, or one of the franchisee folks? If no one else will point it out, I will: There would be none of the blogging about Ergun Caner had not Ergun Caner conducted a massive, decade plus long, series of lies to the SBC and various organizations, including the US Marine Corps, for the purpose of making money and fame. He has yet to fully admit to and confess his lies. The hoity-toities in the ranks of the SBC pastors and heads of agencies and seminaries continue to support him and have him speak to their congregations. Caner also sued some of those bloggers and sharers of information about his lies. Now, without the lies, no bloggers! So under the rules of logic, Lumpkins statement that the bloggers are responsible for the tragic event is logically the same thing as saying that Ergun Caner;s lies are the causative agent. Lies led to bloggers led to tragedy implies no lies, no bloggers, no tragedy. Ergo Ergun's fault. Lumpkins is a fool. Great comment and Watchdog do not be surprised if Dave Miller makes a blog topic from this blog topic. As a teenager, it was very important to me, to see character and integrity in my dad. I could always trust that what he said was true. I loved the fact that other people respected my dad as well. He was not a wealthy man, but he had character. He didn't try to pretend to be something that he was not. It was hard enough to go through my teenage years with all of the peer pressures and the hormonal changes, but it was a lot easier having a good honest and decent role model in my dad to follow. It was also important to see that the men that my dad surrounded himself with, were of the same integrity and character as he was. They were real men, and not childish brats throwing temper tantrums when their own lack of character got them into trouble. Without those male role models in my life, I don't know how I would have made it through. Men, just remember: You may live a lie to the public. You may play the hypocrite to your congregation. Your children know the truth. They don't care who people THINK YOU ARE. They only care about who they know that you really are. Young boys need men. Real men. Not a cheap imitation of the real thing. One thing I noticed when reading this post was that the webpage generated ads for WWE Summerslam. The ad generation program must have noticed the terms "Lumpkins" and "Caner". "The Warrior" Ergun Caner and "the Mouth of the South" Peter Lumpkins may as well as be a pro wrestling act. They seem to act like one. I think that explains their popularity with a certain demographic. That local Jacksonville pastor sounds like Mac Brunson to me. Peter Pumpkins is an out of control hooptie with bad alignment and no shocks speeding down the highway to a defamation suit. He's one of those idiots who thinks he's smart. That's the most dangerous kind of idiot. wanted to, all it would take would be a few phone calls and Peter would have to either shut up or be unemployed. Their silence as to Peters despicable conduct is deafening. New BBC...It IS terrible when the church is vicious. If everyone wants this to stop why doesn't everybody just stop talking. Before something else horrific happens. The way I see it, everybody wants to blame everybody else...what does it matter, and what is it going to matter if something else awful happens. I think God has had enough my personal observation. Well, if I was God I would have had enough. If you are truly a disciple, you choose to follow Jesus at all cost. You must expect persecution. People hurt and lash out at religious leaders and there family members. That is going to happen. The only thing that you can do is to prepare yourself and your family. I wish that it could be different. Watchdog, TWW, Lumpkins, Hall, Judas, Peter, and others are simply iconic examples of what has happened through the ages and prophetic images of what is coming. Men of God, do not despair. You are attacked because of who you represent. Consider your persecution a joy. Watchdog, TWW, Lumpkins, Hall, Judas, Peter, and others are simply iconic examples of what has happened through the ages and prophetic images of what is coming. Men of God, do not despair. You are attacked because of who you represent. Consider your persecution a joy. Oh, puhleaze. This whole "persecution" spiel is getting old. You really lump Watchdog (no offense, Tom, but I'm sure you'd agree), Dee & Deb (who aren't men), Lumpkins, Hall, and Judas in with Peter? People in the United States have NO idea what persecution is. I'm weary of hearing people like Steve Gaines, Mac Brunson, and Ergun Caner moan and groan that they're being "persecuted" for the sake of the gospel. I call B.S. on that. Pulling down their 6-figure salaries while living in their big houses, driving their nice cars, dressing to the nines, dining at 5-star restaurants, taking vacays all over the world while double dipping on the way there and back... tell Christians in the middle east right now, many of whom have been tortured and even killed for being Christian, that YOU'RE persecuted. Or better yet, go live among them for a while and declare your Christianity from the rooftops. If you can survive not being killed simply because you're American, see how long you last as a Christian in one of those places. If you do survive, maybe you'll learn a whole new definition of "persecution" and can return and speak intelligently on the subject. Until then, please spare us. Please? You make a great point. The level of persecution that preachers endure in this great country is scant compared to the situations that you describe. Here is an excerpt from an earlier post. I asked my dad how he could take all of this in stride and keep his patience. (Christians lashing out, making vain accusations, name calling) His answer was very revealing of his true Christian persona. He said Christ put up with way more. Jesus seemed to understand that people were hurting. The people that hurt the worst seem to cry the loudest and most often. Through their hurt, sometimes damages emerge. It is up to mature Christians to recognize the needs. Understanding, patience, and love are needed to restore and nurture those dear brothers and sisters. I agree. Religious leaders should take the blogosphere in stride. I apologize for leaving you out of the list. I did not intend to present my list as comprehensive. I thank God for Brother Lumpkins. You haters are guilty, guilty, guilty. You are hiding behind the First Amendment. The first amendment is not in the Bible. Thou shalt not bear false witness is in the top ten. QUIT LYING ABOUT DR. CANER!!! Oh, oh, I smell a TROLL!! Does it smell like sulphur? LOL. Nobody is lying about Ergun Caner, except Ergun Caner!!!!! Acts 29 did what the SBC won't do. The "good ol boy" system has got to go. Dave Miller is technically right. There is "official" capacity for the SBC to address Peter Lumpkins, nor JD Hall, nor any other individual. There is no authority to reign down. That network could whisper a word to the wise and calm things down. Or it could openly express the problem and admit that while there is no authority structure to do it, individuals do not care for his actions. And if that individual were Frank Page or Johnny Hunt, Al Mohler or Paige Patterson, it would say a lot. As it is, it's individuals who no one listens to or who have been driven into hiding by the exact same structures with "no authority" over Lumpkins. So Miller is right--officially speaking, there's no authority. But that doesn't mean someone in power shouldn't say something. "QUIT LYING ABOUT DR. CANER!!!" Whether you are a Caner fan or not (I'm not) this article on Caner's remarks at a church yesterday are heartbreaking. Caner, as a proven liar who has yet to confess the lies he has told from many pulpits, should not be preaching anywhere, until he confesses, repents, and does some degree of penance. Yes his remarks are sad, but sadder is that he has yet to confess and repent of his lies. If you haven't you need to listen to the entire sermon. (Link to church's media page is in the ABP article.) Those quotes, taken out of context, sound like those of a humbled man. Unfortunately the sermon in its entirety does not. A little more subdued than usual, but the same old "South" jokes, same dissing his in-laws and wife... and actually comparing his suffering to Christ's. yep...thanks for the heads up BBC...even if Caner has no baggage...his preaching is mostly about himself...stories that bear no connection to the "Cross"...the Church is giving their pulpit to too many men whom lack the humility to preach the "Cross"...even if I had never heard of Caner,...his sermon is one in which I would flee from having to listen to said pastor again...just don't understand why this guy is a so called "super-star"? Doesn't make sense...but then again...tickling ears...if this is what the church goers desire, then so be it...not me!! Give me meat...not milk. Interesting thing is as many jokes or humor Caner tries to use...the laugh track is missing...maybe the congregants just can't laugh after such a tragedy. After watching the video...something does not connect...but BBC , you are right, the quotes in the press do not even come close to covering the overall sermon text. And Caner's take on Galatians 6 is weak at best...my one major complaint to you BBC,,,you have referred me to something that just stole 45 minutes of my time I will never recover...aughhhhhhhhhhhhh!!! Sorry, anon! I lost the same 45 minutes of my life, but I like to experience things in context. I noticed that, too. I have hesitated to say this because people handle and express grief differently, and there's no "right" or "wrong" way to grieve, so I don't want to appear critical of anyone's way of coping. I want to tread carefully here. It just seemed to me there was an odd disconnect between Caner's demeanor and the situation. Maybe it was still the shock of it all which would certainly be understandable. Again, different people have different ways of coping. Some people deal best by throwing themselves back into their work, and maybe this is what Caner is doing. If one didn't know the backstory one would never imagine here was a man whose son had just taken his own life, and I think this was reflected in the audience's hesitation to laugh. It was probably as uncomfortable for them to watch as it was for me. Near the end of Caner's sermon he stated he doesn't care what his "critics and enemies" say about him, how much they persecute him, because he knows they did it to Jesus first. "Crying wolf on religious persecution is dangerous," Cook said in a comment with the link. "It de-sensitizes people to the real thing around the world, and it runs counter to the whole idea of loving our neighbors as ourselves." One way to determine if an individual or group is experiencing actual persecution, Moss said, is by examining the reactions of those experiencing oppression. Around the world, those subjected to deliberate suffering at the hands of others are likely to emphasize, somewhat quietly, that they are not threats to those in power. These groups usually are too frightened to make caustic remarks or wage political fights against their oppressors, Moss said. But when Christians, particularly in the West, are publically (sic) vocal about being persecuted, she said, "they usually are not." One result was to notice the genuine suffering of others, he said. "Finally, I got to see how foolish it was to see myself as persecuted compared to other Christians globally," Cook said. Criticism, even if unmerited, is NOT "persecution." For once let's apply some proper perspective. I can't help but think of the snake oil salesmen and magic elixir sellers that would roll into a town out west and peddle their false hope and powerless potions to an unsuspecting public. Drawing a crowd, giving an entertaining presentation, and then collecting the money. I bet any criticism or questioning of those guys really hurt business. And when enough people knew about their lies, they had to find a new gullible audience in another town. Caner reminds me of these guys. The difference is, the internet allows everyone in every town to know he is coming. Which is good for him in a way, because now the only people that will be in the audience are those that are most gullible or choose to be uninformed. Speaking of claiming to be persecuted...Imagine if your wife was trespassed from her church because you wrote a blog? What if the State Attorney's office issued subpoenas to violate your right to anonymous criticism of powerful people? What if the Sheriff's office used all the powers of the government to investigate you and disclose your identity to a powerful church looking to harm you and your family? Would THAT qualify as being "persecuted" for your opinions/beliefs? Or ask Mr. Autry if he experienced any real persecution when he was dragged into court and sued for speaking the truth? What if there was merely just some blogger writing disagreements or criticisms about Autry or the Watchdog, wouldn't that be nothing compared to what they went through? Yes, pastor, they could only wish their "persecution" involved some bloggers criticizing them. Yet they will tell you (while speaking for God from the pulpit) that "criticism is the number one problem in the church today." And they will have judges draft and read and approve "resolutions against unjust criticism." Tell the family going through a divorce the number one problem is criticism. Tell the dad that his son committed suicide that his number one problem is criticism. Tell the single mom trying to survive financially that criticism is the number one problem. Tell those Christians in the middle east that saw their children beheaded that criticism is the number one problem in the church. It is sickening really. Self centered preachers who are out of touch with reality stomping around, spitting into the air, living like kings, talking about being persecuted. Why would anyone want to be, or stay, a Christian? The more you get to know God, the more you will see these snake oil salesmen for who they are. Peace. Tell the dad that his son committed suicide that his number one problem is criticism. Well, that almost seems to be what Caner is claiming about himself. For me that was another aspect of the "disconnect" of which you spoke, anon. He seemed more passionate about his critics than his own family's tragic loss. I wrote the original Anon post at 5:32 on Aug 18. I should have listened to the sermon online before I made those comments and assumed the reporter had been fair. I'll give it a listen when I get a chance and I'll ruin 45 minutes of my life too. The Appeals Committee of SACSCOC, according to the disclosure statement issued June 26, 2014, stated that the committee would convene on one of the following dates. August, 18,19, or 20, 2014. It seems that most of these post I read I accidently ran across this one today. I don't follow this ungodly junk. I know you think you are doing God's work by continuing to stir the pot. However I know you will not like this post. I was reading in Psalms 37 after I read this post and had to come back and post. I normally don't post on things like this because I do not want to be consider a Gossip nor a trouble maker. God's word is clear where these folks will spend eternity. I am not sure who the wicked ones are but I am sure that God knows. 10 A little while, and the wicked person will be no more; though you look for him, he will not be there. 11 But the humble will inherit the land and will enjoy abundant prosperity. 12 The wicked person schemes against the righteous and gnashes his teeth at him. 13 The Lord laughs at him because He sees that his day is coming. 14 The wicked have drawn the sword and strung the bow to bring down the afflicted and needy and to slaughter those whose way is upright. A Child of God should always seek peace. It seems that some of you have a lot to say that does not bring peace. I sure hope your sword does not end up in your own heart. Does not anybody in the SBC consider that perhaps Caner's cultural background or strongholds in the religion of rage may have oppressed down on him. Lumpkin ought to rescind this notion that White has said as the "blame." But at the same time Tom what are YOU doing Tom to unite and reconciliatory. I have stayed off this blog and Wartburg rant for about a month. I beginning to think ALL of you are a bunch of waste of time to read personally. Sometimes they have been interesting and informing. But personally I don't I don't see any guidelines in these blog of REALLY being reconciliatory NOR stating your procedures in how there is the EFFORT to do so. At least James White has the right idea, that is VIDEOING himself and point by point illustrating his points carefully. Show yourself guys. But you know I am convinced after ten years on reading Luther that he was a blowhard too and could not show up in the Swiss council with Zwingli to reconcile the issue of the Lord Supper. If he saw it as clearly as a reference to the Passover maybe he would not a diatribe "On Jews." Even those in the Lutheran church was embarrassed by that writing and buried in the archives for centuries before it was drudged up in the late 1800's. Be ye reconcilers mates. Why is Lumpy cyber-bullying the poor pastor over wine? Doesn't Lumpy know he is being a class A hypocrite when he does things like this? EXPOSE this pastor's wrong doing, yet Ergun Caner tells the same dozen lies year after year? Jesus made gallons of wine for a wedding and there are over many positive verses on wine in the bible unless you play Lumpy's shell game. Lumpy edits out tons of post on his blog so don't even try posting something like this there.